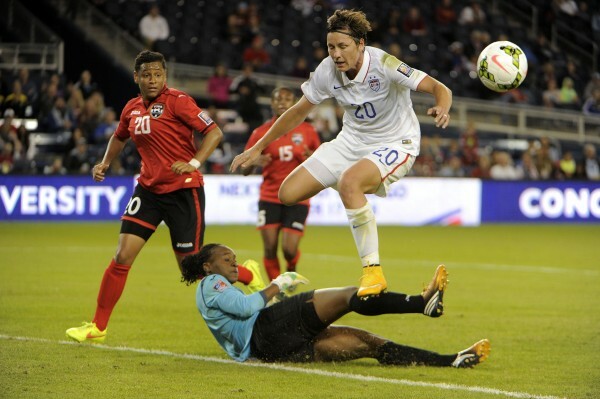 Trinidad goalkeeper Kimika Forbes (1) makes a save against USA forward Abby Wambach (20) in the second half during a women's World Cup qualifier soccer match at Sporting Park on Oct. 15, 2014. KANSAS CITY, Kansas — Last fall, Kimika Forbes was instrumental in leading the University of Maine at Fort Kent to the United States Collegiate Athletic Association national championship. On Wednesday night, the senior displayed her talents for the Trinidad and Tobago women’s national team. Forbes made nine saves, but the heavily favored United States team scratched out a single goal in a 1-0 victory over Trinidad and Tobago in their opening game in the 2014 CONCACAF Women’s Championship. SoccerAmerica called Forbes a “fortress” for her squad. Abby Wambach tallied her 171st international goal to help the U.S. win while posting a 29-7 advantage in shots. The Americans have outscored their opponents 68-0 in 10 CONCACAF matches. SoccerAmerica reported Forbes’ most impressive save of the contest came in minute 52, when she thwarted a breakaway attempt by Wambach. She also stopped Sydney Leroux with a left-leg save during stoppage time. Forbes is playing for her country after earning a spot last summer on the reserve team of the Boston Breakers, a Women’s Premier Soccer League franchise. Forbes was honored as a USCAA All-America first-team selection in 2013 after posting a 14-1-1 record with coach Lucas Levesque’s Bengals. Last season, she made 74 saves on 80 shots, a sparkling save percentage of .925 that was the best in the association. Forbes also posted eight shutouts. Levesque explained that Forbes transferred to UMFK after spending two years at Monroe Community College in New York, where she was recognized as a National Junior College Athletic Association All-American. Forbes is studying elementary education and has been on the Dean’s List every semester since enrolling at UMFK, Levesque said. Her soccer future appears to be bright as, according to SoccerAmerica, Trinidad and Tobago coach Randy Waldrum indicated he plans to invite Forbes to try out for the Houston Dash of the National Women’s Soccer League, which he also coaches.